Protect future sales & help your clients out - It’s a win-win! For more than 30 years, Del Condominium Rentals Inc., has been the most trusted name in condominium rental management. Our program is designed to provide peace-of-mind through our end-to-end rental management solutions for your clients including: marketing, tenant screening, leasing, maintenance, repair, accounting, insurance coverage, compliance enforcement and revenue retrieval. Refer clients to us and get rewarded for it at the same time! Every time you refer a Homeowner to Del Condominium Rentals and they become an active client, we'll send you 20% on the first month’s lease value. It’s that simple and that good. We make it easy to get started - It's super simple! Simply fill out the referral form to get started. Remember, you'll want to let your client know to expect our call in advance. A member of our team will call your client and start the property management process. Don't worry, we'll take great care of them. 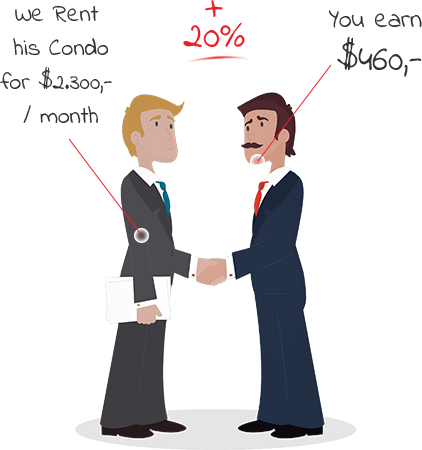 We will pay you 20% of the first months leasing fee. Send us a referral and we'll keep them happy and profitable. When it's time to sell, we refer the clients back to you. We never take your sales. Don't open a can of worms, offering advice on landlord-tenant law or trying to advise on property owner insurance. Instead entrust your clients to us and we'll tackle the tricky stuff. We know how hard it is to build a great reputation, and we'd never want to take chances that hurt your business. We'll work diligently to keep your customers happy. After we receive the first month's payment, we'll cut you a check for 20% of the leasing fee collected. It's that easy. 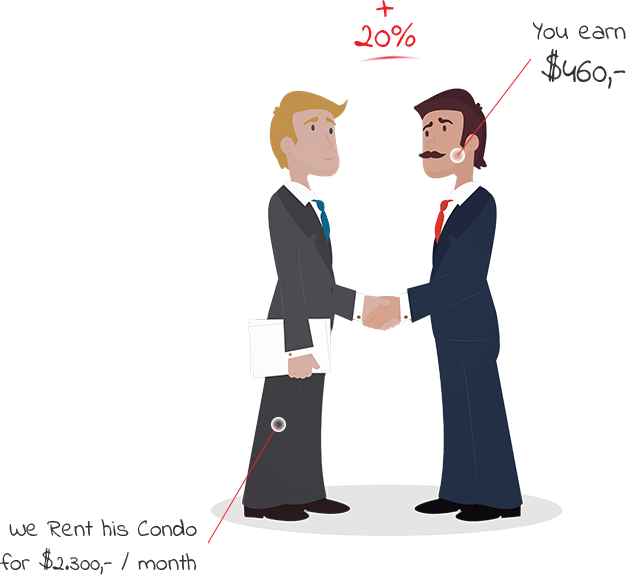 Refer a Condo Owner and Get Paid.